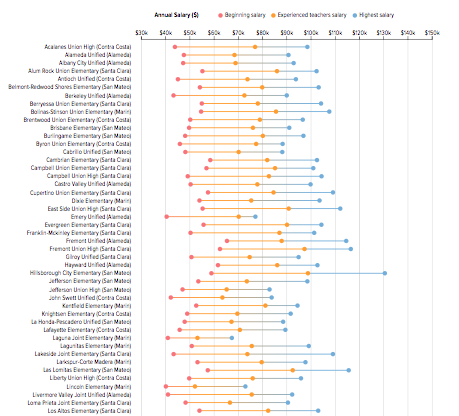 Great chart but I would love to be able to break it down by county and separate elementary from high school districts- any way we can do that? Thanks! This chart would be much more useful if there was a similar graphic showing total compensation. As a stand-alone chart it is very misleading. Some school districts make teachers pay the full price of health benefits, others partially subsidize, and a very few might still pay for the full cost of a teacher’s family’s heath insurance.